Fifteen and a half feet wide and nearly seven feet high, the mural is, actually, wallpaper. Water-resistant, it’s a print-out of a digital collage that Jost assembled from dozens of hand-painted elements: gray rocky shore, purple spiky urchins, orange crabs and sea cucumbers, gray-blue mussels, green sea lettuce, clouds, water, seagulls, even a giant Pacific octopus. 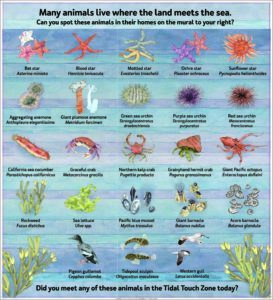 Each of the 23 different organisms is reproduced in a grid on the poster that Jost and Hale are sizing. 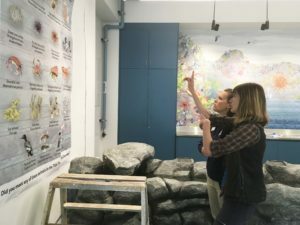 Placed next to the touch tanks, it invites visitors (especially children) to see how many of those creatures and plants they can identity both in the big mural behind and in the tanks themselves. Maria Jost painted every sea creature in her mural separately. This enabled her to duplicate them around the mural, as well as in this educational poster above the touch tanks. But this mural isn’t just a pretty picture. Jost was chosen for this work – a piece of public art paid for by the 1% for art mandated for all public works projects in Tacoma – because she’s not just an artist. She’s also a scientist. 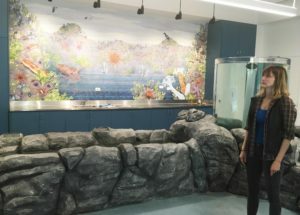 With a bachelor degree in biology and a master’s in science education under her belt, she works during the day as a science teacher at Tacoma’s Science and Math Institute, the high school that has a campus right on grounds at Point Defiance Zoo & Aquarium. And so her art is infused with both delicate imagination and rigorous biological precision – perfect for an aquarium where science meets magic. “This project has been perfect for my skills and interest,” says Jost, who spent many hours studying the marine creatures in the Zoo’s old North Pacific Aquarium before beginning painting. She also conferred with Zoo aquarists to incorporate scientific details that truly show how these animals live and function. Jost confers with guest engagement coordinator Amy Hale on placement of the poster. Jost – whose other artwork includes a series of botanical drawings, the “Deep Sea Synergy” mural at Tacoma’s Embellish Salon and an online/real life public art project about the ocean in West Seattle – also spent a lot of time observing animals in real life, wandering the Puget Sound shore near her own home. In the process of painting she “got to know the individual organisms – their form and color.” Then came a deeper dive into the broader ecology – where these creatures live, and how. It’s exactly the process her students encounter in the school’s art classes, which roam the Zoo for life drawing lessons. Finally, assembling each organism into a collage took the painting from art to life, says Jost. The effect, for viewers, is a unique fusion of imagination and science.